This is a transcription of a ledger that is in the possession of the La Plata County Clerk's Office. The spine of the ledger says "Coroner's Record, 1, La Plata County." 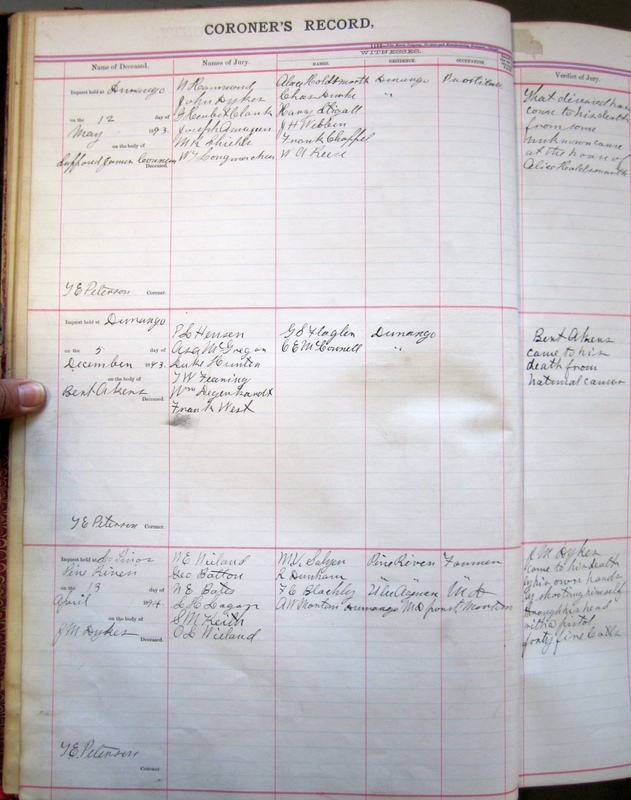 The original ledger may contain information in addition to what was transcribed. To receive an image of the original document via email, please use the submission form on the Home page of this site. Be sure to include your name, email address, the page number, the date of the entry and the name of the person to whom the voucher was issued as listed in the transcription. Click the thumbnail to see a larger view of a sample image from this ledger. Click to view the cover of this record book. Height: 5 ft 4 1/2"
Height: 5 ft 9 "
This data is presented in the order that it was recorded in the original ledger. The word 'blank' means that no information was recorded in that column in the ledger. A hyphen in a date column means that no date was recorded. To search for a specific name on this web page, use your browser's "Find" function. In most cases, you may activate this function by pressing Ctrl+F and then typing the word you desire to find into the box that appears. cause to his death by unavoidable accident Rail Road wreck. came by his death by a falling rock in the Hesperus coal mine striking him i n the head killing him istantly. Took his own life by means of a dose of laudanum. That the deceased came to his death by means unknown to this Jury. That from the evidence of the witnesses given before us, we are unable to state the cause of death. Found dead. Death caused by old age and dissipation. No jury. Deceased was mining coal at Porter Mine when a rock dropped from what is known as a "pot hole" in the roof. Denver, Colo. by Pete Peterson. to be sent to her mother if requested.Will be held till friends claim them. None except what rightfully belonged to father & mother, he living at home. Funeral charges be secured by them. Buried city free ground as per Hoods plot. Died of old age aided by indulgence in strong drink. Deemed not necessary to hold inquest. Died by cutting her jugular vein with pocket knife - positive evidence that she done this deed herself without aid. To have held inquest would have been folly. Body buried at Bayfield Colo Feb 6th. Died of his own hand by gun shot wound instrument being 44 colt revolver. Bullet entered just above right ear & back of right temple ranging to the back & on level of lobe of left ear shattering skull & scattering brains. has been at El Passo (sic) Tex. Regular form. We do say that he met his death by being crushed between 2 cars accidentally while attempting a coupling at D.& R.G. R.R. yards at Durango Colo.
None except 1/4 interest in horse shoe restaurant & 9.15 in money. Found dead in horse shoe restaurant. Died of heart failure according to certificate made out by Dr. F E Prewitt. 7.15 left in hands of owner of restaurant. That the said W.J. Thompson came to his death on Main Avenue on the sidewalk near the front of the El Moro saloon in Durango as the result of gunshot wounds received from a gun in the hands of Jesse C. Stansel. Personal effects surrendered to Mrs. Thompson, wife of deceased, without inventory. Suicide from strychnine poisoning. Autopsy prepared by coroner. The said Manuel Aragon came to his death from the effects of a gun shot wound at the hands of a party or parties unknown & we further believe the said wound was inflicted with felinous (sic) intent. That Carmine Dolis came to his death by an accident in the Hesperus coal mine caused by the falling of loose(?) rock due to carlesness (sic) on the fault of the deceased. That we are unable from the evidence presented to determine where how by whom or the cause of the death of said infant or that said death was caused by any person or persons. That Feusto Salas came to his death from gunshot wounds inflicted from the gun in the hands of Santiago Gardunio. Body found in river near Mexican Flats. Names of jury on file in County Clerk's Office. On file at County Clerk's Office. Fell to bottom of well.